TWO of the most wanted persons in the province of Zamboanga del Norte were arrested in separate manhunt operations, the police reported. Arrested were Rene Apawon, 44, a public utility driver; and Fernando Rigor, 45, a fisherman. 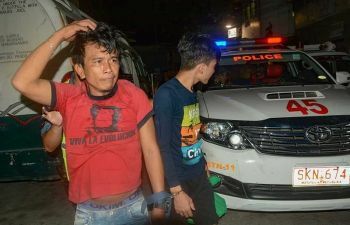 The Police Regional Office (PRO) Zamboanga Peninsula said Apawon was arrested 5 p.m. Thursday, March 21, in Sitio Ibapo in the village of Mactan, Lapu Lapu City, Cebu. Apawon topped the list of most wanted persons in the municipality of Godod, Zamboanga del Norte. Apawon had a standing warrant of arrest for murder and frustrated murder issued by the court of Liloy, Zamboanga del Norte. Meanwhile, Rigor was arrested around 9:30 a.m. Saturday, March 23, in the village of Taguilon, Dapitan City, Zamboanga del Norte. Rigor was listed as the top 2 most wanted person in Sindangan, Zamboanga del Norte.